At Volvo Laval, we know that in order to provide an incomparable experience, we have to offer you more for your money. Unparalleled customer service is one thing, but if we can help you save money it's even better. At Volvo Laval, you save on all our Volvo services and products at all times. Giving you more for your money is of great importance for the Volvo Laval team. We know that you have several options when buying your next vehicle or servicing your current Volvo, and we want to ensure that we stand out. At Volvo Laval, you can save on all our Volvo services and products in inventory. We also have special offers on our maintenance and repair services. 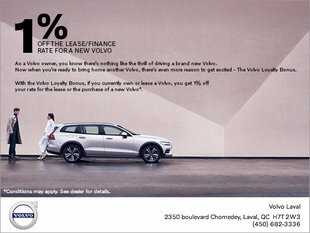 At Volvo Laval, it's easy to save and you'll always feel like you're getting a good deal. We also have several offers and discounts on our new and pre-owned Volvo vehicles, as well as attractive and affordable financing and leasing options. At Volvo Laval, it's easy to save money when you buy a new Volvo or certified pre-owned vehicle. Over the years, we have distinguished ourselves at Volvo Laval by offering our customers a level of service that stands out and by giving more to our customers. Make sure to keep an eye on this page to be informed of the latest Volvo offers. We also have seasonal offers as well as discounts on our detailing maintenance services, summer and winter tires, and much more. Come and see our special offers today or visit this page regularly, as our offers are updated on a monthly basis.